I have been blessed with some sweet blogging friendships since I started blogging two months ago. 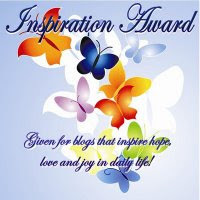 Hopefully I blog so that my words and God’s Word will uplift, refresh, amuse, encourage, and not to receive awards. I am grateful for the awards, but all honor and glory goes to our Lord, Jesus Christ. 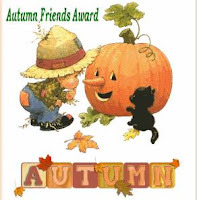 Thank you Serendipity for sharing the Autumn Friends Award and also Denise for these three awesome awards too. My dear friend BP blessed me with a lovely award. 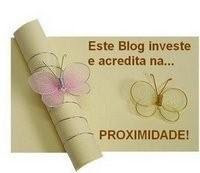 “To translate the gift from Portuguese to English, it means:"This blog invests and believes, the proximity"[meaning, that blogging makes us 'close' -being close through proxy]” How awesome! So with this prize we are to deliver it to 8 bloggers that in turn are to do the same thing and put the above text. So, I want to pass this award on to the following 8 bloggers. All of these blogs make me smile, they encourage my heart, and they encourage others as well. Congrats on all your awards, Michele! You are such a sweet friend and you deserve all these awards and so much more as you share your life with us and encourage us. Thanks for sharing these awards with me. I am so humbled and thankful for them. May God continue to bless you as you seek to be a blessing and encouragement to me and others. I am so glad to meet you through blogging. Thanks for all your prayers and encouragements. Take care and have a blessed weekend! Congrats on your awards and Thank you so much for passing them onto me. Have a great weekend. Oh, sweet friend, thank you so much! Congratulations to you, I just love stopping by your blog, and thank you for blessing me too! Congrat's to you! and thank-you! I am so glad that you are in the blog world...it's so nice to stay in touch with my Aunt again! Congrats on all your lovely awards, Michele! Certainly well deserved! And thank you for sharing the award with us. Truly humbled. thank you so much for the award. I'm sorry I haven't been by sooner to say thanks but we've had a rough rough days. Spencer was in the hospital on Sunday with a major seizure so I'm just now getting a chance to respond.